If you're a girl who loves to sparkle and shine, The Glitter Collection Bible is for you. Its compact size lets you take it anywhere - school, church, home, or wherever! This Bible contains the complete text of the clear, accessible New International Version, the world's most popular modern English Bible. The NIV brings you as close as you can get to the reading experience of the original audience. In every verse it seeks to offer the optimum combination of transparency to the original text and transparency to the original meaning. NIV Glitter Bible Collection Flexicover Pink Heart by New International Version was published by Hodder & Stoughton in January 2014 and is our 17859th best seller. 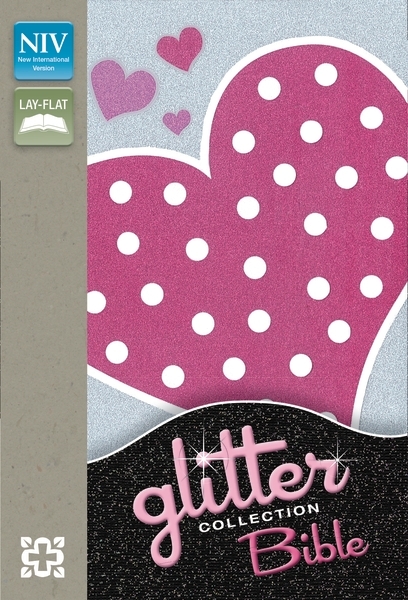 The ISBN for NIV Glitter Bible Collection Flexicover Pink Heart is 9781444793406. Be the first to review NIV Glitter Bible Collection Flexicover Pink Heart! Got a question? No problem! Just click here to ask us about NIV Glitter Bible Collection Flexicover Pink Heart.